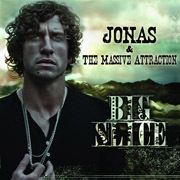 As if we weren't punished enough with acts like Nickelback yet, Jonas comes - also from Canada - with his "massive attraction". But this is exactly what keeps within limits. "Big Slice" is absolutely predictable and sometimes so full of clichés, that for the upscale rock music fan foreign shame is once again the order of the day. Despite hard rock tendencies, what is offered here is rather pop. Shallow melodies and a cuddly rock atmosphere that covers everything make mothers dream of the ideal son-in-law.